I often tell people that my office is the best place to work on campus. Here, I get to meet with students as they weigh the first major decision of their lives: Where to go to college? For some, the decision's an easy one. They're choosing the institution whose programs match their academic interests. For others though, the choice is more difficult. A good number of students don't decide on a major until their college careers are well underway. Others have multiple interests and passions and aren't sure which path to take. These are the students who are searching for the institution they connect with — the place that just feels right. And for many, the college choice simply comes down to one word: cost. There's no doubt about it — college is a sizable investment. Yet, it's so essentially critical to our futures. Ask college graduates anywhere and they'll tell you their education was among the most important investments they ever made. It provides membership to the lifelong club of eternal curiosity. The more we know, the more apt we are to question, discuss, explore, seek and find. The diploma you receive at commencement is so much more than just a piece of paper to frame and hang on your wall. A baccalaureate degree from Augustana affirms that you invested wisely, worked hard, and are well educated. You will commence from here ready and eager to participate in conversations, engage in debates, forge new frontiers, question the status quo and discover the unknown. Since 1860, Augustana College has prepared young men and women to lead, change and serve the world by providing a deep and rich foundation in faith, history, science, literature, language and service. After spending four years on this campus, we believe our graduates are well-suited to contribute and thrive in virtually any field, anywhere in the world. Our most recent job placement rates are proof of that. Among our 2011 graduates seeking employment, 97 percent have accepted a position related to their major or chosen field. It's a figure that speaks to the power of a liberal arts education — particularly in the current economy. At Augustana, we know that investing in the education of students who make significant academic achievements, exhibit honorable character and illustrate a clear commitment to social responsibility goes far beyond their time on campus. We view these investments as an endowment for the good of tomorrow. That's why we're committed to partnering with students and families to make an Augustana education as affordable as possible. During the 2011-12 academic year alone, we awarded $22.9 million in scholarships and grants to our students. Here, we're proud of the fact that the vast majority of our students receive merit-based scholarships and need-based financial aid. So, how does the process work? Where should you begin? In order to receive the best financial aid package possible, we recommend that you file your Free Application for Federal Student Aid (FAFSA) in a timely manner and communicate frequently with our Office of Financial Aid, widely considered to be the most knowledgeable in the region by parents and students. As you prepare to file your FAFSA, here is some important information you'll want to know. We encourage students and parents to utilize the new IRS Data Retrieval system. This allows direct data transfer from the IRS and will mean less chance of being selected for Federal Verification. In order to use the data retrieval system, families are encouraged to file federal income taxes electronically, wait two weeks, then file the FAFSA using the IRS Data Retrieval option. Federal Verification is a process whereby the college must gather documentation from the student and family to verify the accuracy of information reported. In the past, signed copies of the Federal Income Tax Return were used in the verification process. Beginning with the 2012-13 academic year, Federal Income Tax Returns will no longer be sufficient for verification. If a student file is selected for verification, the student and parent will be required to request an IRS Tax Return Transcript from the IRS. There is a specific procedure for requesting the Transcript; and it will take approximately 10-14 days to receive the Transcript. This is why it will be important to lessen your chances of being selected for verification by using the Data Retrieval feature when filing the FAFSA. Families who have not yet completed their taxes should file the FAFSA using estimated information, even though you will not be able to use the Data Retrieval option at this time. Once you have filed your taxes, you will be required to update your FAFSA with official data. At that time, you will want to choose the Data Retrieval option, provided there has been sufficient time for your tax information to reach the IRS. If you have questions or need additional information, please contact us at 605.274.5216 or financial.aid@augie.edu. The fact that you are considering Augustana means you are special. You must have that certain "something" that's hard to define. 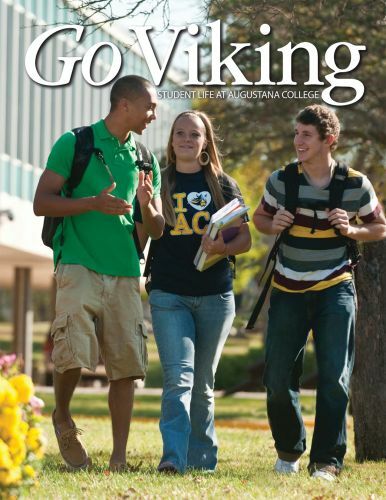 We often say that Augustana students are called to "Go Viking." They understand that in order to create an even better tomorrow, they must explore and discover bold concepts and important ideas today. So thank you for having the courage to explore and discover today — and thanks in advance for all we're certain you'll do to create an even better tomorrow. We look forward to working with you to help you achieve your academic and career goals.